Easily create unique size charts either for each product separately or for the whole category of products. Magento size guide will help your clients make the right choice and stay satisfied with their purchase. This magento size chart popup is an efficient tool allowing both store admins and visitors to the site enjoy its simplicity and reliability. With this extension you will be able to easily create unique size charts either for each product separately or for the whole category of products. Site admin can also configure magento size attributes to be inherited from a parent category by the one of the lower level. The size chart will be displayed on store product pages. Using the visual HTML editor you can also add custom charts, which makes this magento size extension a really easy-to-use tool providing exceptional possibilities. Display size charts for clothing, jewelry, shoes, home, eyewear, pets, international size conversion charts, etc. - This Magento extension will fit them all! Depending on your magento store design you can incorporate a product Size Chart in the form of Popup window or inside product page content. Switch size chart style at any time, use different layouts for different products - it’s that easy! Assign specific size charts for each category separately or inherit size charts from a parent category. Flexible configuration allows you to create unique size charts for each individual product. Advanced users can create flexible Display Rules and show a size chart based on product attributes. Size Chart Display Rules can override catalog and product settings and replace all other size charts inherited or defined on catalog or product level. Be creative! Use the built-in visual HTML editor to create cool looking size charts for your store. Insert pictures, tables & videos, change colors & styles to make a unique look and help your customer better choose the right product. Magento Size Chart was designed to work flawlessly on any third party magento theme. Whether it is your own custom theme or a popular theme like Ultimo, Shopper, Fortis, etc. – it supports them all. Yes, if you are selling garments then Getting Correct Size is one of the biggest problem. 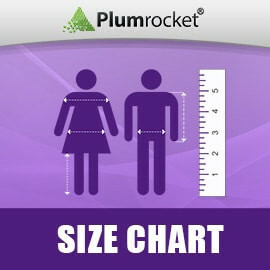 As soon as we started using the Plumrocket Size Chart extension our return and replacement rate decrease to 1% only. Thumbs up for the extension. We love it. There are many possibilities and it looks good and professional. Also it is really easy for the customer to use. Excellent! Meet all my expectations. Can create so much size charts as needed. Work as described. I was looking long for an extension like this, and finally, I find it! Excellencet custmer service and very good module. It is a great module in its simplicity. Very easy to install and if you experience any problems guys from plumrocket will help you in a timely manner. Good extension and very easy to use! It is possible to create different languages. If you still have doubts, I would definitely recommend this extension. This size chart extension is really well thought and it works like a charm out of the box. It has many ways to assign the chart to target products. Again, keep up the good work Plumrocket! Good module with good support. i was very pleased to see that it was working fine. Yes, Plumricket Size Chart extension is really working very fine! I've tried another size chart before, but it did not display properly. Thanks to your update, I was able to upgrade my website from M1 to M2. High level of customization, based on blocks, even able to quickly synchronize with internal software using bps tools. This is what I needed. Recomend for every shop with clothes or shoes, but not only. Works as advertised, excellent support, recommended. Worked well in our case so we were able to provide customers with size charts for our products - clothes and shoes. This extension was super easy to use - a true click & play experience. It also looks very, very professional - just like what the big boys use. Thanks! Smooth installation and simple to configure and use. After installation you can quick add this size charts to you products. With the HTML editor you can simply style the Charts. We had been selling one brand of apparel and not doing our sizing very well then went to list another brand. The brands used different sizing systems and we wanted some size charts available without taking item description space but be available in the product so they didn't click away. We tried a few other "cheaper" modules but none quite met out requirements. So using the "get what you pay for" principle we purchased this size chart module from Plumrocket and it worked perfectly. We have different brand and gender size charts which appear with the appropriate products. Using their "table class" name formats the tables nicely. We use with a very popular template and have had no integration issues. Ufa! Now I only make one size chart of the store's clothes and apply it to an entire category. When I need to change, I only need to change in 1 place. I use 25 measurement tables. It is great with pictures, links and more. Easy to setup, It has lots of features to add, and looks really nice and professional. Great support by the staff, i had a small issue and the support helped me right away. Worked out of the box. Easy interface to use at the back end to tweak the design and content according to your eCommerce. User experience friendly too. love it. The extension works as described with no issues at all. Whenever i needed the help of the Plumrocket team, they answered super fast and of course gave me a solution! Great extension - great dev team! A must have for any Magento clothing store!! I gave this extension five stars because it was worth buying! !I The web designer had trouble installing it so I contacted Plumrocket. Plumrocket was very quick to respond and to install the extension for me!! Customers service was exceptional!! I am definitely going to buy this extension for all my other Magento clothing shops. I would recommend Size Chart Magento Extension to everyone who has a clothing store! Hi I can recommend the ext. It works well! Instalation is very easy. After short config we could start. It helps our customers to find correct size. A valuable extension for your store if you sell clothes or footwear, we have some slippers and we needed an easy way to let the customer know what the sizes were. Easy to install and setup, with two ways to show the customer how to see the chart. Wonderful Service! Reliable and Super fast. I was extremely happy the way I got support from the team! I recommend this company to those who wants to customize their store with advanced features and save a lot of money for less price. I will be using Plumrocket service again! Thanks for being so super fast and giving the right solution as we wanted. Great! and just loved it. Excellent extension, works as described and expected. One of the great things we encountered with Plumrocket extensions is they will work perfectly once the installation is complete, no need to fix anything. We were able to incorporate the extension on the product page the way we wanted. Support was excellent. We had a challenging set up with multi language and multi store, and support team has adjusted the extension to allow store view option, so we can have different sizing charts on different website, particularly valuable for multi language webstore set up. Looking forward to the ability to multi-select on General rules selection and Store view. It is important to guide customer during his experience. And Size Chart allowed for each categories is very wonderful. Rather than manually copy pasting the size measurements table for each product, this feature help to simplifies the manual work with just a single button. Great for vendor as it increases efficiency of work and great for customers because it make the pages neater. We bought this extension because we needed different size scales for different products and we wanted them positioned on the page a certain way. SO we paid a few bucks more for the instal and tech support and the team at Plumrocket did excellent work and they did it quickly. When we first got it back from them, we went back and told them we needed additional changes and they did those changes quickly and very efficiently. It was a very pleasant experience and now when I am looking for a Magento extension, I always look to see what these guys have before looking anywhere else. I give 5 stars without hesitation. Bought this extension and yeah it is a very good extensions. Very useful in our e-commerce platform as you allow customers to view the chart size and it appears at the front-end of every products without you having to redirect customer to another new page. Yes! I do recommend this extension. Size chart + online retail. Best match! A must have, speaking of fashion retail! Works out of the box with great solid open source for a great tweaking to match all aspect off your theme and styles! Happiest customer ever looking forward to keep scaling projects with Plumrockets amazing extensions and support. Thank you! very useful and easy to use extension. Plug design is very good, its function is perfect. I am very satisfied. Very good addon I have seen, very easy to install, just upload & done. Work as describe, highly recommended. i would pay double the price for this extension. Thanks for your great service . Besides the amazing support the team provides, this extension has run flawlessly on 6 stores over 2 magento installations. They have been very quick to solve any problems I have. The option for a full HTML area and replaceable "size chart" button makes this extension so much more powerful. Perfect solution, easy to implement very useful. Awesome Support, Does what it promises. We have a Movie and TV website that sells thousands of t-shirts, we wanted to be able to offer a size guide based on the manufacturer as they vary from one to another. This was the perfect solution, easy to implement and to style for our theme. Nice and easy to install, set up and use. I did have a problem positioning my chart button but it was soon fixed by the excellent support. Don't hesitate to buy this extension for your website! Nice and neat extension. The way of how it looks like and where it displays can be easily customized. It gives me no more trouble creating custom charts. Regards to developers!